Next time you are trying to decide if you walk a golf course or get a cart, consider this story. An Arkansas golfer noticed his golf cart not working properly as he played the 7th hole last week. 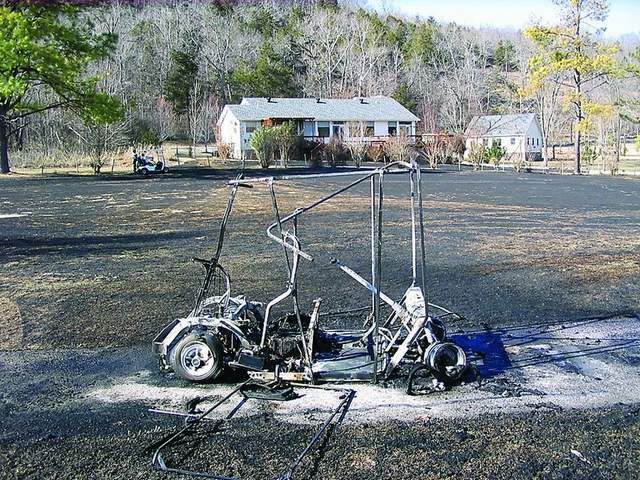 When he was checking out the problem, the battery operated golf cart caught fire, and exploded. The golfer burnt his hand attempting to rescue his golf clubs from the fire. The fire incinerated the golf cart leaving all but the frame behind. The fire spread to the surrounding grass and burnt half an acre of fairway before local firefighters put out the blaze. Hat tip to Waggle Room and ProGolfTalk. So not only his putter, but all his irons were on fire? Regular preventative maintenance would have solved this problem. First time I have ever heard of this.